A lot of people are asking, What’s going on in Harney County that has drawn the attention of what Oregon Live writer Les Zaitz calls “self-styled patriots”. It’s not clear what he means by that unless he considers himself the Grand Poobah in charge of defining who is and who is not a patriot. In typical mainstream media fashion, he wrote a story that “bleeds”. The feature picture is of a man in camo with a scary looking gun using a tree as cover in military style. Zaitz begins his story, “The strangers carrying the whisper of danger in the vast territory of the Harney Basin just before the holidays”. Oh! The drama of it all. He must have learned his trade in Hollywood because his story reads more like a script for a Rambo sequel than a news story. In truth, there isn’t much difference between fiction and what passes for journalism in the mainstream media these days so he’s right in step with his peers. First, to dispel any misconceptions, nobody that this writer knows is going for the purposes of having a showdown at the OK corral. There are no plans to interfere with the Hammonds turning themselves in to federal officials. The Hammonds are casualties in the war that the out-of-control Administrative State is waging against the American people. Remedy for the Hammonds will have to come at some later date (hopefully) by different people. The rally this weekend is to demonstrate care and concern for the Hammond family in what has been a gross miscarriage of justice through abuse of prosecutorial discretion. More importantly however, it is a demonstration for the benefit of the fourth branch of government – the Administrative State to tell them that we see you, we are beginning to understand you, and we are coming for you – not with guns, but with legal process. That’s no doubt why the Oregon Live writer chose drama and fiction because understanding the legal process to deal with an out of control Administrative State is pretty dry stuff – but absolutely necessary to reclaim the sovereignty of our counties and states because it’s really only The People who can do it. 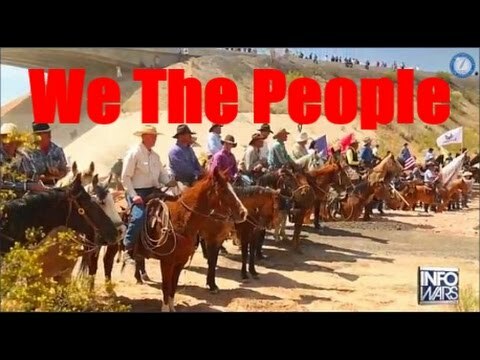 Ammon Bundy’s activities in Harney County have been to assist the people of the County in the process of notification that the social compact between the government and the people has been broken. The Hammond Case proves that there is not a farmer, rancher, or homeowner for that matter that is safe from the Administrative State in Harney County. Local government officials failed in their obligation to protect the citizens of the county from federal encroachment and abuse. The first step in the process was to establish a Harney County Committee of Safety. The second step was to file a notice seeking Redress of Grievance (See Page 3 for links to sign on). To date, two notices seeking Redress of Grievance have been filed with the public officials of Harney County. There has been no response. If they continue with no response, the Committee of Safety will seek their removal from office. Recently a group of Idaho Legislators held a press conference to inform the electorate of an action by the Idaho Department of Water Resources acting as a proxy for the Environmental Protection Agency to implement new conditions for water rights holders in the Treasure Valley. Rather than sounding like the powerful individuals they should be as legislators of the state, they sounded more like beggars seeking assistance from the people and it is this writer’s belief that they were in fact seeking the assistance of the people. The point being that the overreach of the Administrative State is not limited to Harney County and it’s not limited to grazing and land management. The Administrative State is out of control and is attempting an unconstitutional, tyrannical power grab to control all of the natural resources in this country and as they have proved, they will stop at nothing to secure that control. We all have an obligation to future generations of Americans to stop this power grab by the Administrative State. To accomplish that, we need the citizens in every county in this country to follow in the footsteps of the people in Harney County by establishing a Committee of Safety to assist public officials if they are standing up and fulfilling their obligations to their citizens or alternately to replace them if they are not as the Harney County officials are not. The time is now – and we are the ones who must do this.